(TORONTO) – Canadians who need a truck for work are looking for power, fuel-efficiency, utility, and comfort that they can depend on. That’s why Toyota has upgraded the Toyota Tundra full-size, work-ready pickup truck for the 2010 model year with a new 4.6 litre V8 engine available on 4x2 and 4x4 2010 Tundra models. With 310 horsepower, 327 lb-ft. of torque and a combined fuel consumption rating of 12.1 L/100 km, this new engine achieves 12 per cent more horsepower and an 11 per cent improvement in fuel consumption versus the 4.7 litre engine it replaces, making the 2010 Tundra with 4.6 litre engine the most fuel efficient conventional full size pickup truck. Finally, all 15 Tundra models adopt new standard safety and design features regardless of engine, cab and cargo bed configurations, making Tundra ready for whatever job you need to throw at it. A choice of 15 models – five 4x2 Tundra models and 10 4x4 Tundra modelss. From the Tundra 4x2 Regular Cab Long Bed 4.6L to the Tundra 4x4 CrewMax Platinum 5.7L, there’s a Tundra to suit every need, taste and budget. A choice of three cab sizes: the three-passenger Regular Cab, five or six-passenger Double Cab, or five or six-passenger CrewMax cab. A choice of three bed lengths: 5.5 foot, 6.5 foot, or 8.1 foot – big enough to haul full size plywood, drywall or other sheet materials. More models fitted with Toyota’s adjustable headlamp levelling system as standard; more models fitted with fog lamps as standard; more models fitted with towing mirrors as standard; and an upgraded available navigation system that responds to voice commands. Additional convenience equipment, including: more models standard fitted with features such as map lamps, an auto dimming rear view mirror with integrated compass, an integrated garage door opener, and/or a fold down seatback table fitted to the front passenger seat. A new 4.6L i-FORCE V8 and six-speed automatic with TOW/HAUL mode and Acoustic Control Induction System (ACIS), available on two 4x2 models and three 4x4 models. ACIS optimizes power and torque output. Compared to the 4.7L engine and five-speed transmission on 2009 Tundra models, this new combination delivers 12 per cent more peak horsepower (310 vs. 276), more peak torque (327 lb-ft vs. 313 lb-ft) and an 11 per cent improvement in fuel efficiency (combined city/highway of 12.1 L / 100 km vs. 13.6 L / 100 km), making the Tundra with 4.6 litre engine the most fuel efficient conventional full size pickup truck. New Leather and Navigation Package available on 4x4 Double Cab SR5 4.6L model adds DVD-based Navigation system, 20-inch alloy wheels and tires, leather seats, and heated front seats. The powerful and capable 5.7L i-FORCE V8 in three Tundra 4x2 models and seven Tundra 4x4 models. This proven engine delivers 381 horsepower and 401 lb-ft of torque, plus a towing capacity of up to 10,800 lbs / 4,895 KG, with a combined city/highway fuel efficiency of 13.3 L / 100 KM (4x2) or 14.5 L / 100 km (4x4). A new Toyota Tundra 4x4 CrewMax Platinum 5.7L model, featuring: new 20” aluminum alloy wheels; perforated leather seat surfaces with ventilated and heated front seats; integrated XM Satellite Radio and USB audio input; woodgrain trim, woodgrain steering wheel, and leather and woodgrain shift knob; interior chrome trim and silver-painted inner door handles; auto up/down power windows for the driver and front passenger; and more. 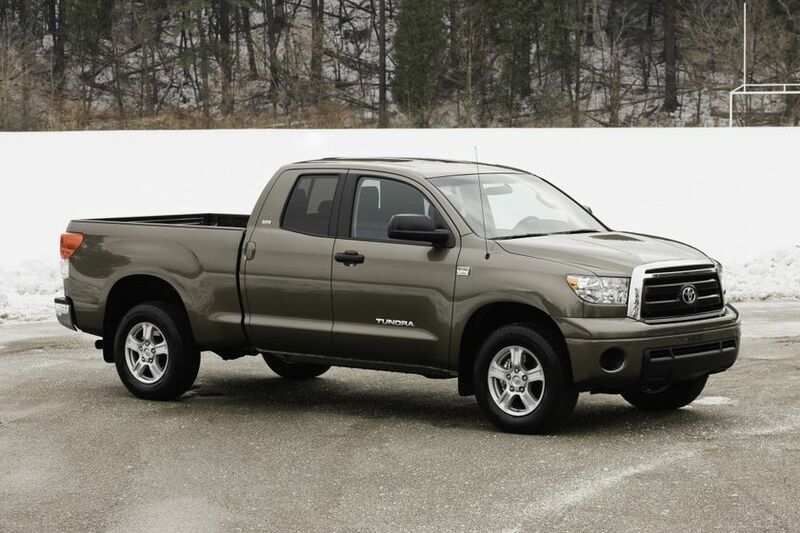 The 2010 Toyota Tundra full-size pick up truck is now on sale across Canada, with a manufacturer’s suggested retail price starting at $25,310.